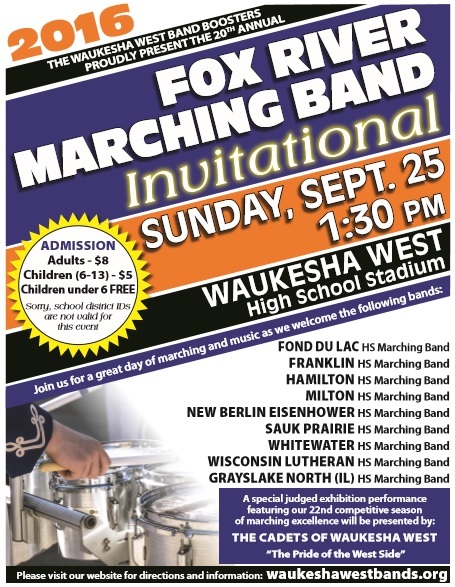 The Waukesha West High School Band Boosters will host the 20th Annual Fox River Marching Band Invitational on Sunday, September 25, beginning at 1:30 P.M. Scheduled to perform this year are marching bands from Fond du Lac, Franklin, Hamilton, Milton, New Berlin Eisenhower, Sauk Prairie, Whitewater and Wisconsin Lutheran high schools in Wisconsin and Grayslake North High School in Illinois. The show will conclude with a judged exhibition by The Cadets of Waukesha West. Food and beverages will be available for purchase from the concession stand. Tickets for adults are $8.00, children age 6-13 are $5.00, and children under 6 are free. For directions to the school, click here. For more information call 262-970-4005. 2:30pm New Berlin Eisenhower H.S.